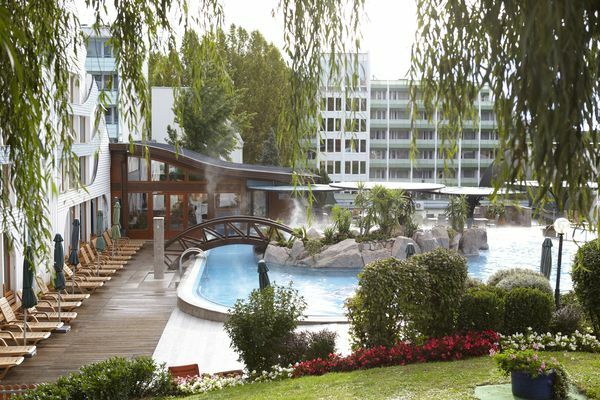 The NaturMed Hotel Carbona**** superior in Hévíz welcomes you to a Mediterranean-style environment with its magnificent activity pool, 1000 m2 surface of water, air-conditioned rooms, thermal bath evoking the atmosphere of the Roman era and numerous therapeutic and wellness opportunities all year round! 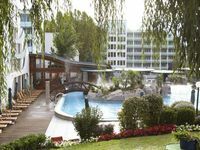 The NaturMed Hotel Carbona**** with an enclosed and guarded Car Park and Coach Parking lots is located in the centre of the spa town Hévíz, in an arboretum-like 4.6 hectares park. Apart from 260 air-conditioned balconied rooms and apartments with baths / shower all equipped with modern conveniences (hairdryer, telephone, satellite TV, radio, mini-bar and room safe) there are also specially furnished rooms for the physically challenged and the allergy sufferers. Bathrobes are provided for guests' use during their stay. The pleasant hotel restaurant invites guests to enjoy Hungarian and international food specialities, reform dishes, hearty buffet breakfasts, sit on the terrace café, listen to live music in the drink bar and taste Mediterranean-style dishes, drink and cocktail specialities at the pool bar. The Platán Café & Juice Bar serves freshly-squeezed organic vegetable and fruit juices beside coffee and cocktail specialities all-day. Our well-equipped air-conditioned conference and meeting rooms with seating capacity of more than 200 provide are an ideal venue for business meetings and talks in a quiet setting. One of Hungary's most beautiful open-air activity pools features a semi-covered water surface, pampering hydro-massage and bubble beds, bubble jet bath, showers, massage jets, children's paddling pool and water-chute in a pleasant Mediterranean-like environment with a sunbathing enclosure that ensure complete recreation. • Half board is included in room rates. • Pets are allowed for an extra charge of 20 EUR per day. • Rates exclude tourist tax (1.60 EUR per person per night).